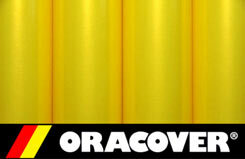 All Products > "5524036 2Mtr Oracover Pearl Yellow"
The professional model aircraft covering material. No slackening, wrinkling or sagging in sunlight - plus legendary strength and puncture-resistance! This excellent polyester covering is highly temperature UNCRITICAL during application making it easy to use for all R/C model aircraft projects.